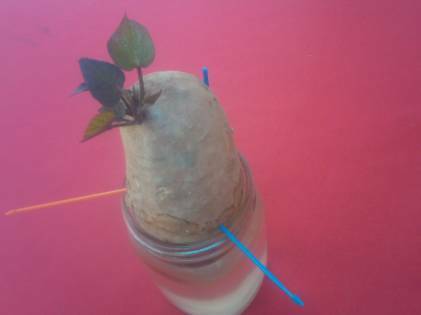 In about mid-April, you can place some sweet potatoes in jars of water to get some sprouts to grow. Then you can plant those sprouts outside, and come harvest time, you will have tons of sweet potatoes to eat, enjoy, sell and share! But even if you didn't start sweet potato slips this year, you can do a little bit of math to see how a do-it-yourself garden project like this can save you - or make you - a sweeeet amount of money! That is your "initial investment" in this project. Now cut each one in half. Surely you have six plain jars or clear glasses around your house that the sweet potato halves can fit inside. Surely you have some toothpicks, too - and water coming out of your faucet? Therefore, your only "start-up cost" is what you spent on the three sweet potatoes. Follow the activity plan, above, to set up the sweet potatoes to sprout slips for you. Now wait 2-3 weeks! Let the sprouts grow 'til they are 6" long. Then gently twist them off the sweet potato. Lay them sideways in a bowl of water so that the bottoms of the stems are in the water. It's best to put this bowl of water where it won't get knocked over, out of direct sun, but a place where there's plenty of indirect light, and it's pretty warm. A kitchen windowsill or a sunny indoor back porch are perfect. This should "root" the slips so that each will have a "rootball" that's a couple of inches long. Once you have those rootballs, you can plant the sweet potato slips outside in the warm garden soil - mid- to late May is best, since the soil needs to be pretty warm, day and night, to make the sweet potatoes grow. Last, but certainly not least, let's check the dollar value of your work. Did you come up with 360 sweet potatoes for #5? That's the answer. Now imagine that you could sell them at a grocery store or Farmers Market for full retail price. (You wouldn't charge that much because you're a KIDS group and don't have to figure on any harvest, transportation, storage or retailing costs, but just imagine that you could get full retail price.) So what's the dollar value? Remember that a medium sweet potato costs about $1.29? If you produced 360 sweet potatoes, and could sell them each for $1.29, how much money have you just made? (see answer below) All you have to do is subtract your initial investment - your answer in #1 - and what you spent on fertilizer and water over the summer months, which usually is not much. WOW! How do you like these economics? Pretty sweeeeet!!! ANSWERS: #1 -- $3.87 . . . #4 - 36 slips . . . #7 - 360 slips . . .